The Rosecliff Mansion Wedding Photos were taken at a crown jewel of Rhode Island and home to one of Newport’s largest ballrooms. The mansion has a rich history, having been used as the setting for some of the most lavish and magnificent Newport gatherings. It was even the location for a number of movies including The Great Gatsby and 27 Dresses. As you can tell by the above photograph, the famous mansion also sets the stage for the perfect wedding day. This beautiful couple celebrated their nuptials in true “Jazz Age” fashion, with a party that would have rivaled any of Gatsby’s. 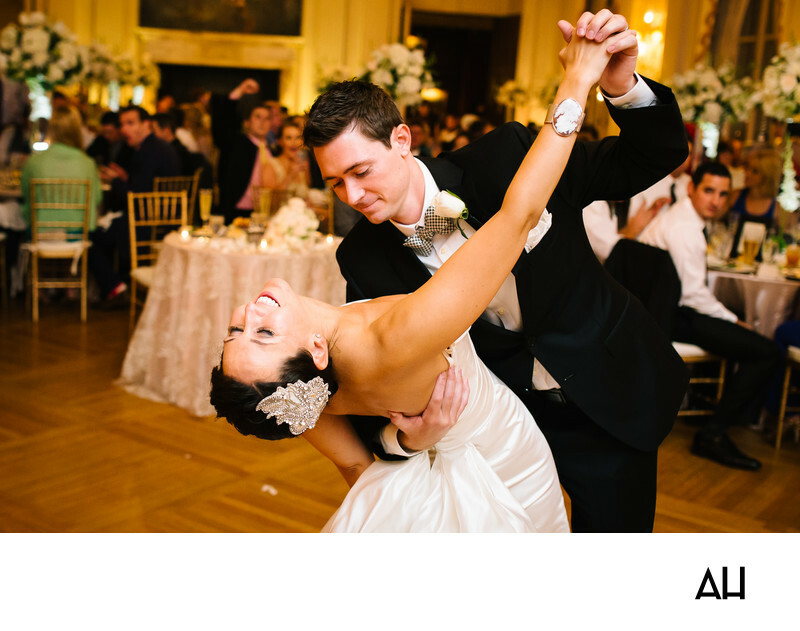 As you can see in the Rosecliff Mansion Wedding Photos, the bride and groom dipped, twirled, and danced the night away; the love in the bright eyes of the groom for his wife apparent throughout the evening. The pair complemented one another in both energy and looks. The groom donned a uniquely checkered bow tie, while the bride had her own special accessories, including a sparkling head-piece and antique bracelet. The two were pure magic to behold and it was a wonder to witness their love. The venue lived up to the mansion’s legacy and provided the new Mr. and Mrs. with the ideal space. Guests were able to view the majesty of the historical house as they took part in the events of the day. At the reception, those present were transported into a fairy-tale as the couple descended the heart-shaped staircase of the ballroom. The ballroom was decorated in classic white flowers and linens that accented the splendor of the scene. When they weren’t on the dance floor, guests sat in garden chairs under the ballroom’s high ceilings, socializing and tapping their feet to the beat of the music. By the end of the evening, feet were sore, bellies were full, and hearts were overflowing.